The Dallas Stars are the ninth NHL team to host the annual classic. The 2020 Bridgestone Winter Classic will set the record for the southern-most location for any signature NHL outdoor contest. Tickets for the event will go on sale April 23. Under the classic entrance of one of football's most historic sites, the NHL gave a glimpse at what a hockey game in the Cotton Bowl will look like. 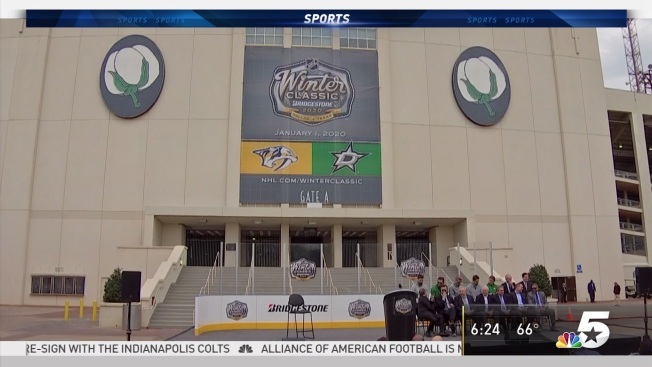 At a press conference in front of the stadium's main entrance, the Dallas Stars and Nashville Predators were officially announced as the two teams set to face off on January 1st, 2020, in the NHL's twelfth outdoor Winter Classic. "You are not going to believe what this iconic venue is going to look like," said NHL commissioner Gary Bettman. "Dallas and Nashville are quintessential examples of the hockey boom." "I've never played outdoor hockey, it was always street hockey for me (growing up)," said Dallas Stars captain Jamie Benn. "You never thought we'd play an outdoor hockey game in Texas. I'm definitely looking forward to this." Logistically, playing a hockey game in a stadium the size of the Cotton Bowl creates a unique set of challenges. For example, organizers are expecting the spectators will approach 80,000, four times the size of a maximum capacity crowd in the Stars home of the American Airlines Center. "It's a lot bigger than an NHL rink, so we'll have to adjust," said Dallas Stars goalie Ben Bishop. "But you watch (the Winter Classic), dream about it, and think it's the coolest thing in the world. You see college football games in this stadium and see how many people are there. Now we get the same opportunity. It's a dream-come-true, a great opportunity for all of us and it should be a lot of fun." The weather and potential warm temperatures in North Texas on New Year's Day could be a factor as well, though the NHL's commissioner believes the league is prepared. "We've played an outdoor game in Los Angeles," said Bettman. "Our icemakers are incredible at what they do. If we didn't think we could have a great, successful event here, we wouldn't have announced what we have." Confident in success in outdoor hockey in Dallas, and confident the Winter Classic in the Cotton Bowl will grow the game in North Texas in the years ahead. The first edition of the classic was held in 2008 at Buffalo's Ralph Wilson Stadium -- home of the NFL's Bills -- between the Sabres and Pittsburgh Penguins. Dallas is the ninth team to host the annual classic, joining the Boston Bruins, Buffalo Sabres, Chicago Blackhawks, Detroit Red Wings, Philadelphia Flyers, Pittsburgh Penguins, St. Louis Blues and Washington Capitals. The 2020 Bridgestone NHL Winter Classic® will set the record for the southern-most location for any signature NHL outdoor contest. Only NFL, MLB and college football stadiums have hosted the event, limiting potential venues in Dallas-Fort Worth to places like Globe Life Park, AT&T Stadium and the Cotton Bowl. Tickets for the event will go on sale April 23. For more information about the game and to enter for a chance to win tickets, click here.